Translated by A. Wright and C. Byington. 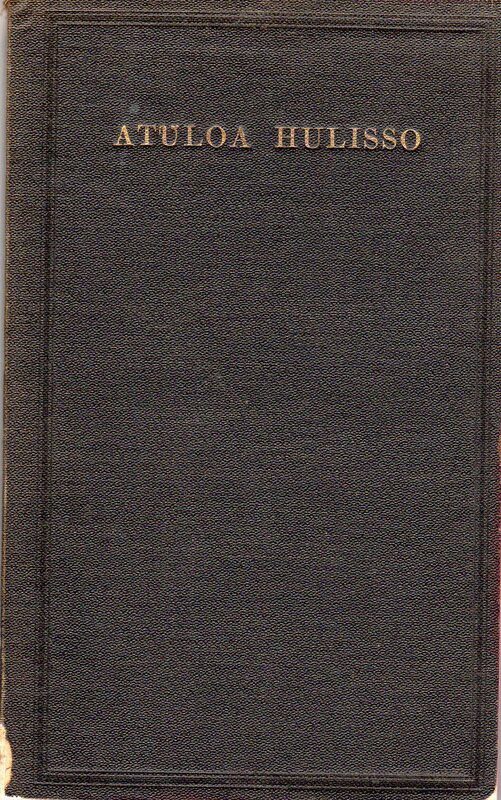 References: Book of a Thousand Tongues (1972) entry 265, Darlow & Moule see 3051. Comments: This is likely a facsimile or a reprint using the same plates as the 1848 edition. 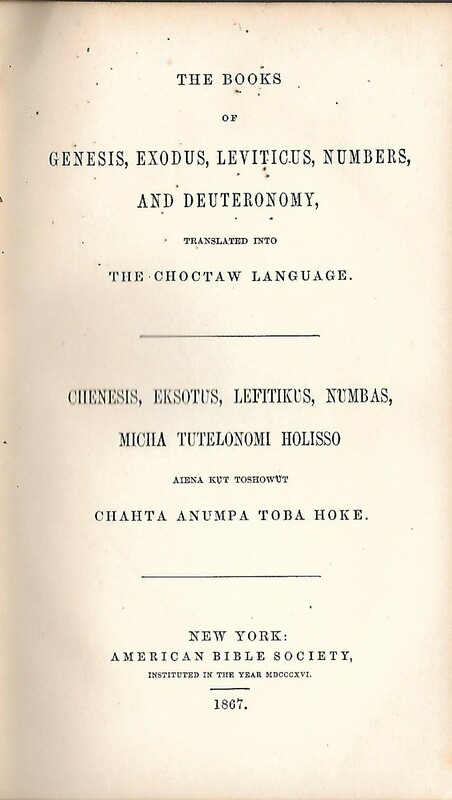 Title: The Books of Genesis, Exodus, Leviticus, Numbers, and Deuteronomy, translated into the Choctaw language. Chenesis, Eksotus, Lefitikưs, Nưmbas, micha Tutelonomi holisso aiena kưt toshowưt Chahta anumpa toba hoke. New York: American Bible Society, Instituted in the year MDCCCXVI. 1867. 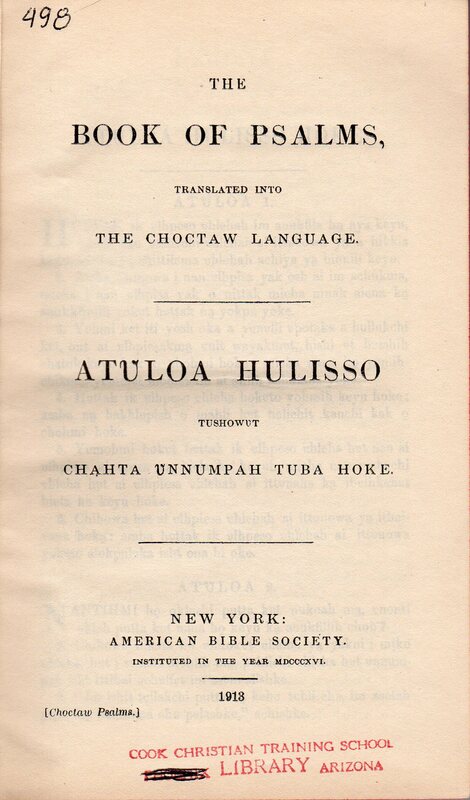 References: Book of a Thousand Tongues (1972) entry 265. 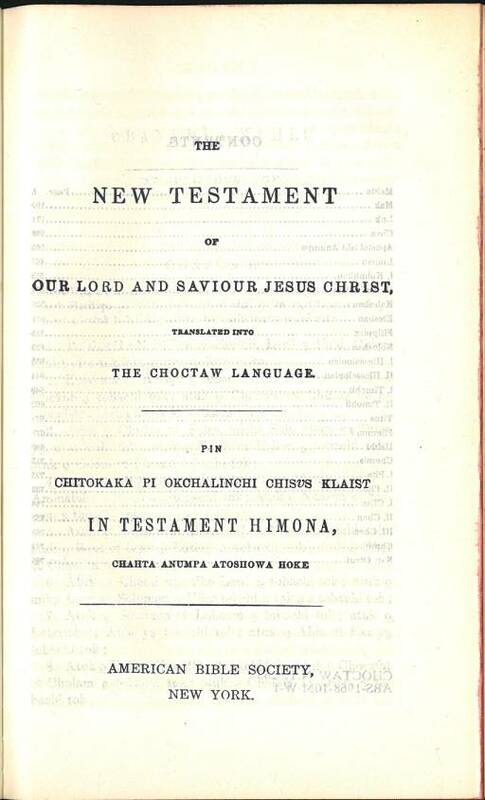 Title: The Book of Psalms, translated into the Choctaw Language. Atưloa hulisso tushowưt chạhta ưnnumpah tuba hoke. 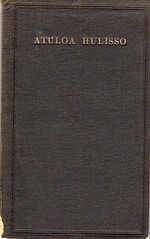 References: Book of a Thousand Tongues (1972) entry 265, Darlow & Moule see 3056. Translated by Alfred Wright and Cyrus Byington, ABCFM, and after the death of Wright in 1853, by John Edwards. They were substantially assisted by Joseph Dukes and W.H. McKinney, educated Choctaws. — From The Book of a Thousand Tongues entry 265.